This is Still a Muslim Ban: Trump’s New Executive Order Decried for Discriminating Based on Religion | Democracy Now! President Donald Trump has signed a new executive order temporarily banning all refugees, as well as people from six majority-Muslim countries, from entering the United States. In contrast to the fanfare that accompanied Trump’s rollout of January’s ill-fated travel ban, Monday’s signing was a decidedly more low-key event. Trump signed the executive order out of public view. Secretary of State Rex Tillerson later outlined the details. The new ban applies to people from Syria, Sudan, Iran, Somalia, Libya and Yemen, but, unlike the original ban, not those from Iraq. Trump’s first Muslim travel ban was blocked by the courts in February amid massive nationwide protests. Unlike the first ban, the new executive order will not apply to people from the six countries with green cards or who already have a visa. Immigration and human rights advocates say the new ban still discriminates against Muslims and fails to address some of their concerns with the previous order. For more, we speak with Faiza Patel, co-director of the Liberty and National Security Program at the Brennan Center. JUAN GONZÁLEZ: President Donald Trump signed a new executive order temporarily banning all refugees yesterday, as well as people from six majority-Muslim countries, from entering the United States. In contrast to the fanfare that accompanied Trump’s rollout of January’s ill-fated travel ban, Monday’s signing was a decidedly more low-key event. Trump signed the executive order out of public view. Secretary of State Rex Tillerson later outlined the details. SECRETARY OF STATE REX TILLERSON: The executive order signed by the president earlier today, Protecting the Nation from Foreign Terrorist Entry into the United States, is a vital measure for strengthening our national security. It is the president’s solemn duty to protect the American people. And with this order, President Trump is exercising his rightful authority to keep our people safe. JUAN GONZÁLEZ: The new ban applies to people from Syria, Sudan, Iran, Somalia, Libya and Yemen, but, unlike the original order, not those from Iraq. Trump’s first Muslim travel ban was blocked by the courts in February amid massive nationwide protests. Unlike the first ban, the new executive order will not apply to people from the six countries with green cards or who already have a visa. AMY GOODMAN: Immigration and human rights advocates say the new ban still discriminates against Muslims and fails to address some of their concerns with the previous order. This is Nihad Awad from the Council on American-Islamic Relations. NIHAD AWAD: This new executive order still stigmatizes the faith of Islam and Muslims. It does not make America any safer but does make America less great. This Muslim order still blocks travel to the U.S. by citizens from six Muslim-majority countries. CAIR continues to receive reports of unconstitutional and systematic ideological questioning of American Muslim citizens and foreign travelers by CBP about their religious values and political views. AMY GOODMAN: For more, we’re joined by Faiza Patel, co-director of the Liberty and National Security Program at the Brennan Center here in New York. Welcome to Democracy Now! Faiza, you say this is still unconstitutional, and you still call it a Muslim ban. Explain. FAIZA PATEL: So, three categories of people were covered by the first order, right? People who had green cards, people who had visas, but also people who will come into the country in the future. And what this new version of the order does is it takes care of the first two categories, but it does—it keeps in place the restrictions, the ban on travel, for anybody else from those countries. So what it’s doing at the end of the day is saying—it’s making a determination that, you know, we just assume that people from these six Muslim-majority countries are terrorist threats, and so we’re just not going to let them in. To me, that’s a Muslim ban. JUAN GONZÁLEZ: And in terms of the difference that you feel that—between the Trump administration’s continuing to say this is not a Muslim ban, because there are many other Muslim countries that are not included in the order, obviously? FAIZA PATEL: Right. Well, you know, I think that the selection of the countries is primarily a political judgment, and we’ve certainly seen that with the—now they’ve dropped Iraq from the list. And the justification given for that is basically, you know, they are our counterterrorism partners, right? They’re—we’re fighting with them. We’re in a ground battle with them, fighting against al-Qaeda and ISIS. And so, that actually, in my view, kind of undermines the overall argument for the ban. On this point that just because it doesn’t discriminate against all Muslims, it’s not a Muslim ban, to me, that argument is laughable. I mean, if you had a law that discriminated against some black people but didn’t discriminate against every single one of them—say, a literacy test for voting—you wouldn’t say that that law was not discriminatory. You would understand that its target was only one race, one ethnicity or one religion. And to me, that’s the essence of discrimination. AMY GOODMAN: What about the fact that Iran [sic] has now been taken off the ban list? It’s gone from seven—Iraq. AMY GOODMAN: —U.S. soldiers, were getting caught. FAIZA PATEL: Well, they had initially already said that they weren’t going to use this ban against people who had these special visas, for people who had worked with the United States in Iraq. But the fact is that—you know, I’m happy for the Iraqis, let me put it that way. On the other hand, you know, the fact that counterterrorism cooperation is the yardstick by which we measure whether or not somebody can come into the country doesn’t strike me as the right measure. When you’re looking at whether or not to issue a visa, you basically look at a couple of things. You look at the likelihood that the person is going to stay in the country, that they’re going to become a permanent resident by any other means, and you look at whether or not they present some kind of security threat. And U.S. embassies around the world, including in the six countries mentioned in the order, do that job. If you look at refusal rates, between 40 and 60 percent of visas from those countries are refused. So it’s not like these embassies and consulates are sitting out there saying, “Oh, we’re just going to let anybody in.” There’s already a strict vetting procedure in place. JUAN GONZÁLEZ: Well, there have been reports of recent documents that were leaked from the Department of Homeland Security that show that national origin is a poor indicator of possible terrorism activity, and, in fact, some reports are saying that as many as half or more of the people who have already been convicted of some terrorism-related acts in the United States were U.S. citizens. So, will that be a possible avenue for further legal challenge of this—of this new order? FAIZA PATEL: Yeah. I mean, I think, look, there’s two things to this. One is the clear discriminatory purpose, which we know from, you know, multitude of statements coming from the Trump campaign, through Rudy Giuliani’s remarks at the time that the first order was issued. The second is the lack of any real national security rationale. I think it’s fairly obvious to most serious commentators that the national security rationale here is simply a pretext. You know, Trump promised he would do a Muslim ban, so he’s trying to do a Muslim ban. AMY GOODMAN: So, let’s go to the announcement of the new travel ban. It wasn’t President Trump, and he wasn’t there with all sorts of people around him. I don’t know if people would stand around him on this one. But Attorney General Jeff Sessions spoke, and he cited the U.S. refugee program as an entry point for potential terrorists. ATTORNEY GENERAL JEFF SESSIONS: First, as President Trump noted in his address to Congress, the majority of people convicted in our courts for terrorism-related offenses since 9/11 came here from abroad. We also know that many people seeking to support or commit terrorist acts will try to enter through our refugee program. In fact, today, more than 300 people, according to the FBI, who came here as refugees are under an FBI investigation today for potential terrorism-related activities. Like every nation, the United States has a right to control who enters our country and to keep out those who would do us harm. This executive order seeks to protect the American people, as well as lawful immigrants, by putting in place an enhanced screening and vetting process for visitors from six countries. AMY GOODMAN: So, that is the attorney general, Jeff Sessions. Your response to what he says? And also, included in this list, it’s interesting who the country—who Donald Trump has chosen and not chosen—for example, not Saudi Arabia. FAIZA PATEL: So, I’d say a couple of things. The first is that the attorney general says that a majority of people convicted of terrorism and terrorism-related offense were foreigners. We actually went back and looked at the data that Sessions is citing to, and about half of the people he’s talking about fall under the category of terrorism-related. That’s a very, very broad category. It includes immigration violations. It includes, you know, having lied to the feds. It could be like illegal cigarette sales. Like, it’s a range of categories. Whether or not those are actually related to terrorism, it’s really hard to tell. But it’s clear to me that by using both those categories, they’re just trying to inflate the numbers. The second point I would raise is the fact that, overall, terrorism of any kind, whether inspired by al-Qaeda, ISIS or sovereign citizen or whatever ideology you’re talking about, are very, very low numbers. I mean, we don’t have huge numbers of terrorist attacks in the United States. Each one has a huge psychological impact, but the overall number is, frankly, quite low. The second thing I’ll say is in terms of the refugee programs. They’ve suddenly started citing this number that the FBI has 300 open terrorism investigations involving refugees. Well, to begin with, they’re not telling you where those refugees came from, so they could be from completely different countries than the ones that are being affected by the ban. Secondly, just because there’s an open investigation doesn’t mean that there is actually a terrorism connection over there. And in respect to that, you know, back in 2011, Charlie Savage of The New York Times published this analysis which showed that, you know, roughly 3.7 percent of FBI investigations even lead to a full investigation, right? And from there, you’ve still got another leap before you get to prosecution. So the fact that, you know, 300 FBI investigations are open involving refugees means very little without any context. 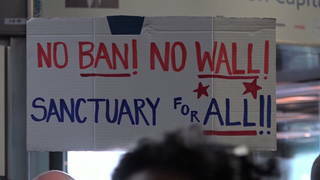 JUAN GONZÁLEZ: Well, on Monday, Washington state Attorney General Bob Ferguson, who sued over the first executive order, held a press conference to address questions about the new order. ATTORNEY GENERAL BOB FERGUSON: The president was essentially afraid to see us in court, because he knew he would lose again. The original executive order, to be blunt, was illegal and unconstitutional. And the fact that they’ve now taken a month, since Judge Robart issued his original decision, to complete a revised executive order, I think, speaks volumes about the constitutionality of that original executive order. JUAN GONZÁLEZ: Your response to his comments? FAIZA PATEL: Well, I think that’s certainly true, that they—this version of the executive order is much more carefully drafted than the first version. I mean, the first one was such an obvious overreach by reaching out to get, you know, green card holders, people who had lived in this country for 10, 12 years, you know, had their lives over here, or people who were students here that were on a student visa studying at universities such as in Washington state. So there’s definitely a narrowing of the order. But it still leaves in place the fundamental discrimination, which is that it assumes that nationality is a proxy for religion, is a proxy for propensity to commit terrorism, and so that we should have these blanket rules that cover people based on country, rather than make individualized determinations as to whether or not someone poses a risk, in which case, of course, it’s perfectly all right to exclude people. AMY GOODMAN: Finally, we just have 30 seconds, but the NYPD has just agreed to over—greater oversight over its intelligence-gathering programs while it seeks to settle a lawsuit over the surveillance of Muslims. Can you talk about the significance of this? FAIZA PATEL: Sure. So, about a year or so ago, the NYPD and plaintiffs reached a settlement agreement, which was meant to tighten the rules around NYPD surveillance of political activity. This came in the wake of AP stories revealing the NYPD’s surveillance of Muslims. The court, which was required to approve the settlement, said, you know, this doesn’t go quite far enough. And it relied in part on this NYPD inspector general report, which had just come out and had pointed to some serious deficiencies in how they continued investigations and how they task informants. So, the NYPD and the plaintiffs’ attorneys went back to the table, and they have now renegotiated the settlement and made it stronger. And it provides more continuing oversight from the civilian member who’s going to be part of the committee overseeing investigations. AMY GOODMAN: Well, we want to thank you very much for joining us. Faiza Patel is with the Brennan Center here in New York. She’s director of the Liberty and National Security Program there, the Brennan Center for Justice. This is Democracy Now! When we come back, Republicans have unveiled their healthcare plan. We’ll find out just what it looks like. Stay with us.